Preston, 1971 is a cornucopia of ASN ro-ros and coasters. A decade later, it is completely dead. Immingham in 1948 is full of railway lines feeding coal to ships in what is now a sea of low-level industrial units and vehicle standage areas. And Grimsby in 1968 - possibly the first double deck linkspan in the UK, to the right of the port tower, which was where the DFDS butter boats including the Dana Maxima berthed right up to the 1990s (and here is why she got her name). (Edit: Just to clarify - I quite understand the rationale and attraction of a route to Larne from Cairnryan. Just not why it was considered the natural evolution of the route from Preston when Preston closed. Opening up a new route, fine. Relocating the UK terminus of an existing route to somewhere that far away, don’t get. Maybe it was seen more as the opening of a new route and closing of an old one than relocating the UK terminus. Can’t deny it was a successful move - it being one of only two routes in the old TT network that is still operating). I assume it was due to the transport links - the Preston bypass (now part of the M6) was Britain's first motorway and you can see in the pictures that even in the 1960s the port fed directly onto a dual carriageway. In later years other places got more connected as the M6 expanded which gave Heysham and Fleetwood more potential for the diagonal routes to NI whilst getting into/through Liverpool became a bit easier, especially from the mid-1970s when the '62 nudged its western nose in that direction. Even before then the M6/East Lancs Road connection was good enough for B&I to brand itself "B+I Motorway" when it launched its first car ferries even adopting a livery which mimicked the then new white and blue motorway road signs. But yes whilst ASN no doubt took traffic with them, Cairnryan was not and is not in quite the same market so they seem to have ceded that diagonal sphere of operation to Pandoro at Fleetwood and Coastlink (P&O (Coast Lines)/Sealink) at Heysham. Hhv do you know why DFDS operated from both Immingham and Grimsby simultaneously? Deep down I think I have some memory of the Immingham ship “calling in” at Grimsby en route out of the Humber, but I might be remembering that wrongly. Either Ionic Ferry (I) or Bardic Ferry in that picture of Preston. That’s fantastic Colin! Very impressive work. (Which probably qualifies you to determine which of the twins is in the photo hhv posted the link to)! I'm far from an expert on DFDS's freighter operations but wasn't Grimsby their historic port and Immingham somewhere that came into their sphere when they bought Tor Line? For a good 15 years or so they then operated from both until finally consolidating in Immingham in the mid-90s. The Grimsby-Esbjerg route was the legacy one with the Immingham-Amsterdam/Gothenburg etc all from Tor Line (I think). Why they didn't consolidate in Immingham earlier I don't know - perhaps the shore-side infrastructure they had in place to handle butter/bacon was of particular import. A quick scan of some DFDS material for clues indicates something else - when the Surrey was introduced in 1969 it was reported that, "Grimsby has been used for many years by DFDS and recently the British government allocated £200,000 towards improving of the container terminal at the port [butter was transported in containers, bacon in trailers] which has been restricted by narrow loading and unloading facilities and lack of storage space.... this money was supplied on the understanding that the company would continue operating through the port and paid for the filling-in of one dock, the opening of another for containers and vehicle cargo, plus additional storage facilities". Although it seems improbable a 1969 agreement was still holding sway by the 1990s perhaps a similar arrangement was made when the Dana Maxima was introduced in 1978. Really first class work Colin, well done sir! 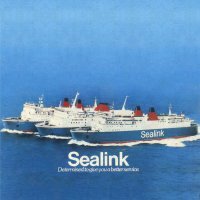 Given the mention of Viking Venturer and Dragon, I thought that some of you might be interested in some of these old pics. Is the 2nd one Maid of Kent? As with VV, taken at Cherbourg. Great series of images, thanks for posting. Yes it's the Maid of Kent leaving for Weymouth. And tucked in behind the Viking Venturer is the Saint Patrick (I). Seconded. Great photos (and great memories). The photo of FE5 is not at Cherbourg; is it Calais? Or perhaps Le Havre? I think TT was still using the original berth at Le Havre when FE5 was on the western Channel, so Calais berth 2 seems the most likely. It’s not Zeebrugge (as the ensign being flown is French, not Belgian). Edit: Just noticed the port control building behind the left-hand crane. It’s definitely Calais 2. Probably in 1985 or 1986, after FE5 was released from Portsmouth back to Dover by the Normandy Ferries takeover and subsequent transfer from Felixstowe of Viscount and Voyager. The photo of Dragon (which must have been taken in 1985) looks like she’s outbound from Portsmouth on the (judging by the sun) mid-afternoon 1500 departure to Le Havre. In the background you can see the usually-submerged wall that links Horse Sand fort with the mainland (as part of the Solent’s submarine defences), and the posts that mark the gap in that wall that is used by small boats. Spot on with Calais Gareth, FE5 on the old Poste 2. I'm taking note of the harbour building in the background with the distinctive red comms mast. Thanks Jonno, yes, spotted that at the same time as you. Is that berth 6 under construction that we can see in the background above the visor? With No5 hidden by her superstructure? Yes I think you're right. Berth 6 was ready in '87, 12 years after No5, strange how they numbered them. I'm sure No3 was new when we travelled across in the summer before I started grammar school in '79. You're jogging memories mentioning the anti submarine barrier, No Man's Land Fort on Dragon's starboard? When we did the sea defences at Southsea in the early '90's a couple of the harbour boat trip lads told tales of keels being ripped off. Glad that they’ve been of interest. Just one question for hhvferry. For the 1st picture at Cherbourg, you said that it was the St Patrick just behind the VV. I’m pretty sure that all these relate to the early 80’s when we started holidaying in France as a family. Yet, a book that I have (‘Crossing the Channel’ by Roy Henderson) says that she was sold to Greek owners in 1971. Seems strange. The photo of Viking Venturer probably dates to around 1982-1983. 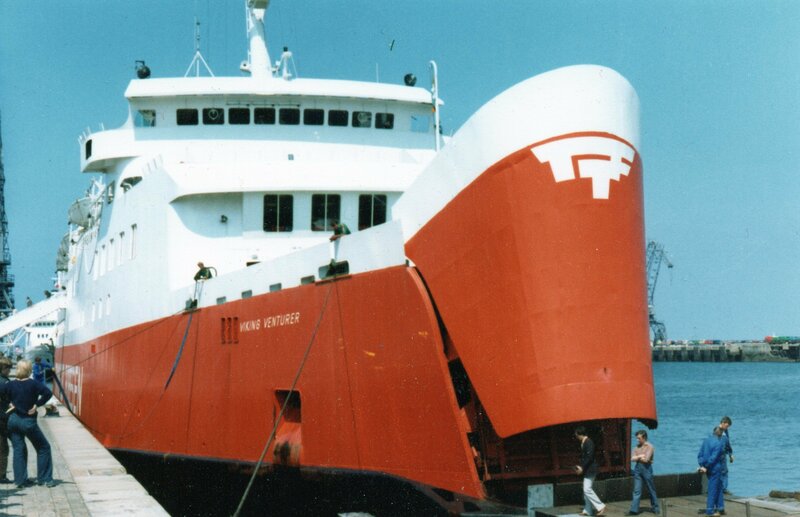 After 1983 the old TTF logo (seen on her bow visor) was replaced with the TT logo (seen on FE5’s funnel). And the berth 3 at Cherbourg (where VV is pictured) was not there prior to 1982ish. So early 80s must be the window. During that time, Saint Patrick (I) and Saint Killian were operating twice a week to Cherbourg, alternating weeks. Arrival from Rosslare was around 1000 local time, and departure to Rosslare was around 2000. So the visiting ICL ship would spend most of the day off the berth, usually laid by at the old cruise terminal (where Saint Patrick is seen in the photo). Different St/Saint Patrick i think. The one in the picture is the Irish Ferries/Irish Continental Lines pioneer car ferry, sister to the Reine Mathilde. The one mentioned sold in the 70s was the BR post-war passenger steamer which finished her days on the Dover Strait. Thanks Colin, what a great set of links. The Portsmouth picture is Viking Venturer, and could have been taken any time between 1978 and 1983. Villandry or Valencay at Newhaven (hvv will probably be able to tell the difference). But the Southampton picture is particularly interesting. We see Dragon in service preparing for her usual 11am departure from the P&O Normandy Ferries berth. 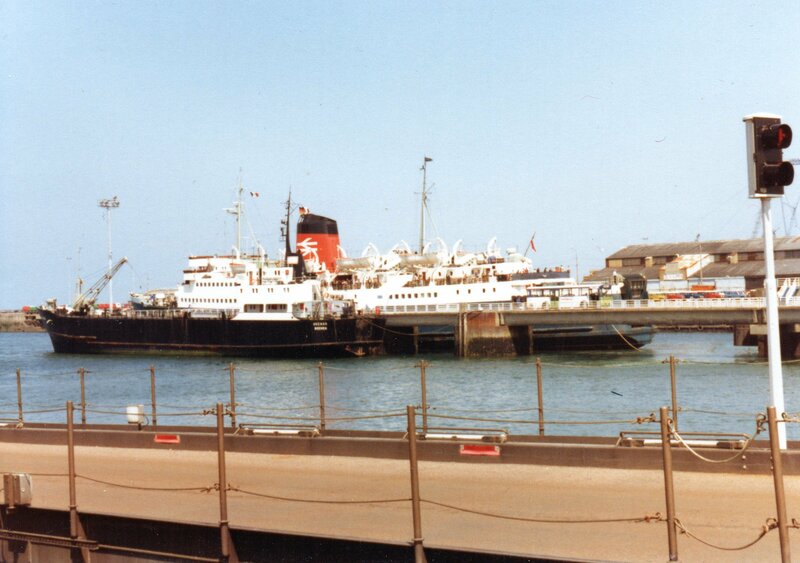 That livery (with P&O Ferries rather than Normandy Ferries on the side) dates from around 1980 I think. But we see FE3 laid up in the Empress Dock, and FE5 bow-in at the original Thoresen berth. This probably dates the photo to something like early 1982, with FE3 having been withdrawn the previous year and FE5 about to take up service at Portsmouth as the sole Cherbourg vessel in 1982. 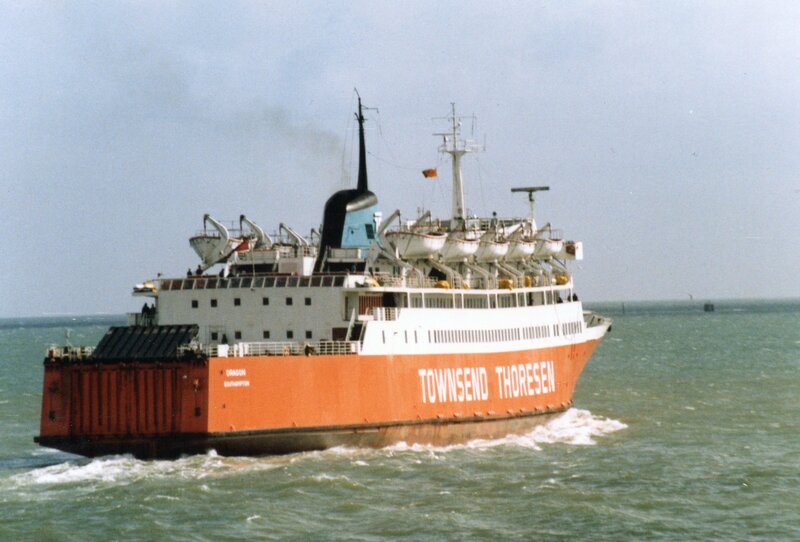 Townesend Thoresen were still using Southampton at that time, but by then had moved across the Princess Alexandra Dock to the berth in front (as the photo is viewed) Dragon. The one occupied by the freighter. What makes this picture particularly interesting is that it implies that Townsend Thoresen still maintained some use of the original berth (the one FE5 is seen at) even after they had moved across the harbour. I hadn't realised that. (The photo cannot have pre-dated the switch of berths at Southampton because FE5 was not on the scene at Southampton when the switch happened). On the far left of the photo in the Ocean Dock at berths 43/44 is the Blue Funnel tanker TANTALUS which is laid up, what's left of the former Ocean Terminal is also clearly visible. Demolition of the Ocean Terminal commenced in the first week of September 1983 and it was almost all demolished within three weeks. 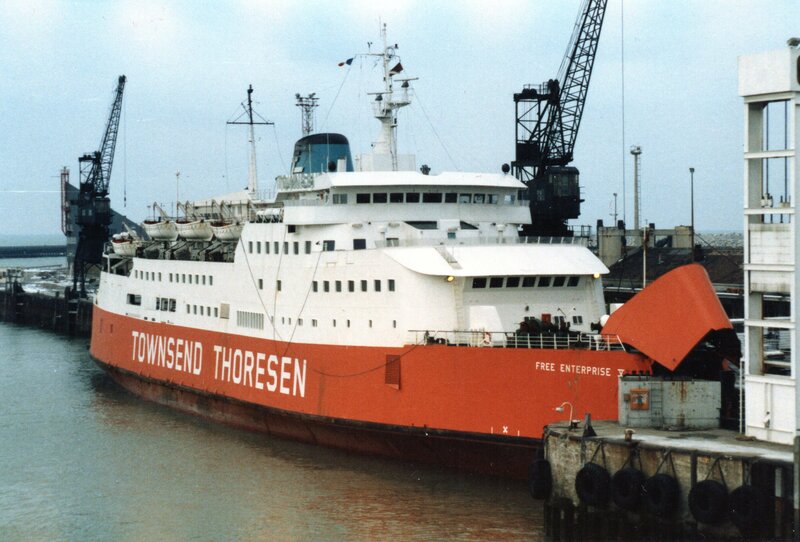 Townsend Thoresen had already moved over from their original berth 7 on the far side of the Princess Alexandra Dock where the FEV is berthed over to berth 3 where the ro/ro freighter MERCHANT NAVIGATOR is, this vessel was chartered by Townsend Thoresen for two years from 1982 to 1983. Townsend Thoresen moved over from berth 7 to berth 3 in April 1980 when that berth became available after McAndrews ceased their ro/ro freight route using the GOYA on the Southampton-Bordeaux-Bilbao-Bordeaux-Southampton route, incidentally the GOYA would return to the port and the same berth in September 1983 when Townsend Thoresen chartered her as a replacement for the Europic Ferry on the Southampton to Le Havre freight route. Berth 7 was still used occasionally for lay ups or destoring although and occasionally for extra freight sailings but not nfor commercial passenger use, during the winter of 1981/1982 both the FEII and FEIII were laid up side by side at berth 7. I'm thinking this photo was taken in late September or very early October 1983 with the FEV having just completed her summer schedule on the Portsmouth to Cherbourg route and is destoring at berth 7. FEIII is laid up at berths 26/27 in the Empress Dock, a few months later she would be sold to the IOMSP. The reefer Universal Reefer is at berths 24/25 and this was her only call at the Port of Southampton under this guise, being a former Blue Star Lines vessel. 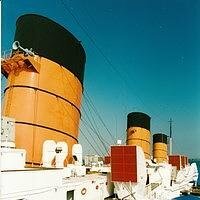 I was working on the Queen Elizabeth 2 at this point and I was on deck as we were preparing to sail at 11.30 bound for New York via Cherbourg when the Universal Reefer arrived which was towards the end of September 1983, I've got a feeling that day was 28th September 1983. That should have read between 16 and the 18 September 1983.